The village Wolxheim, located some 15 km due west of Strasbourg, hosts many inspired producers that have access to several high-class soil types. But even on the greatest terroirs, selection is everything, especially in difficult years such as 2006. 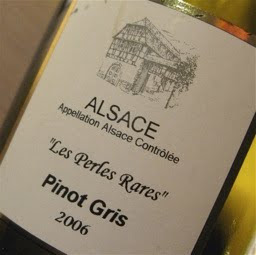 2006 Pinot Gris "Les Perles Rares" is golden in color and has, despite of the vintage, a lovely fresh and pure aroma of clementine, roasted almonds and quince. Despite the residual sugar, the taste is fresh and long with an elegance, saltiness and minerality that resembles a Palo Cortado sherry. Price: € 7.50.